When I reviewed 2001's Time Crunch, I was pleasantly surprised to hear that it was not what I expected, in that there was a lot of variation in style and sound with some strong original compositions alongside some intriguing covers. I had expected more generic song writing, all pretty much upbeat numbers calculated to show off the player's chops. So Niacin certainly came through with the unexpected. But that was 2001, and this is 2005. 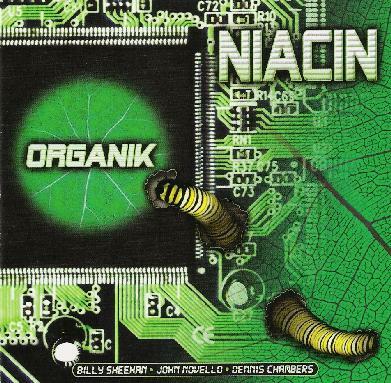 Niacin return with Organik, which turns out to be the album I expected to hear in 2001. Don't get me wrong. Billy Sheehan (bass), John Novello (Hammond organ, piano, and Rhodes), and Dennis Chambers (drums and percussion) are all amazing players. They certainly put on quite a show, skillfully displaying a dazzling amount of virtuosity. I also still enjoy the guitar-free sound, which still rocks like no one's business despite not having that key rock instrument in their line-up. But on Organik, the band rocks relentlessly, with very few changes in pace. Even the one marginally slower paced number, Magnetic Moods, has frantic soloing throughout it, and before it finishes has picked up to a breakneck pace. Musical ideas seem to take second seat to displays of virtuosity. The songs are spectacular but unmemorable: a classic case of style over substance. Even their one cover, Frank Zappa's King Kong, tends to fall into that category. Organik is not a bad album. It's just not a great album. It fails to distinguish itself from countless other impressive demonstrations of musical ability that have mired the genre of fusion since the end of the 70's. For more information you can visit the Niacin web site at: http://www.niacinb3.com.